Accurate segmentation of intervertebral discs is a critical task in clinical diagnosis and treatment. Despite recent progress in applying deep learning to the segmentation of multiple natural image scenarios, addressing of the intervertebral disc segmentation with a small-sized training set are still challenging problems. In this paper, a new framework with fully dilated separable convolution (FDS-CNN) is proposed for the automated segmentation of the intervertebral disc using a small-sized training set. Firstly, a fully dilated separable convolutional network is designed to effectively prevent the loss of context information by reducing the number of down-sampling. Secondly, a multi-modality data fusion and augmentation strategy are proposed, which can increase the number of samples, as well as make full use of multi-modality image data. 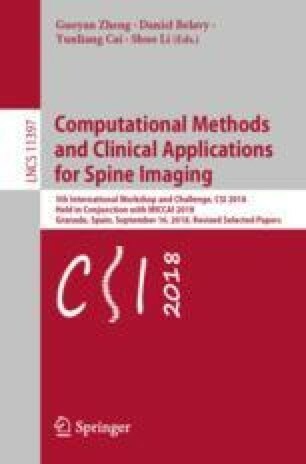 Experimental results validate the proposed framework in the MICCAI 2018 Challenge on Automatic Intervertebral Disc Localization and Segmentation from 3D Multi-modality MR Images, demonstrating excellent performance in comparison with other related segmentation methods. H. Wang and R. Gu—Equal contribution.